I'm pretty excited about this month! May, the flowers start to bloom here in my corner of Ontario, we start hitting warmer temperatures *finally* and it is my birthday month. What can be better than that?? Well, here at t'irla's talk we are doing our first Spotlight Month. 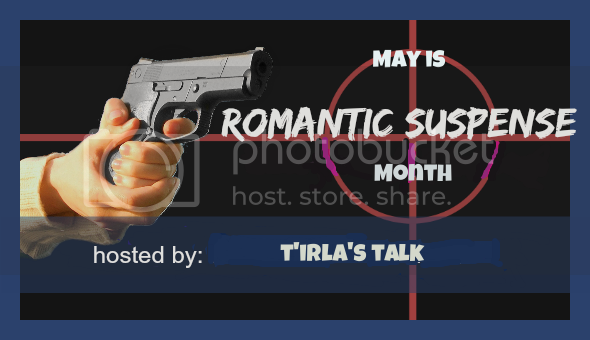 The month of May will be Romantic Suspense Month here at the 'talk'! I have found a lot of my favourite romances have a hint of intrigue or a spark of suspense in them as part of a sub plot or as a vehicle to get the hero and heroine together. I really enjoy that bit of mystery or a dose of thriller. Then there are the books that are labelled Romantic Suspense where the main plot is the suspense or mystery and the subplot is the romance, but rest assured in the books I read there will always be a happily ever after. I hope that we can open everyone's eyes to the role suspense plays in the romance genre and maybe find a new author or two, we might even find a favourite author who has penned romantic suspense under a different name. I would love to hear from you and so you can share with us your favourite Suspenseful romance novel's or even pimp your own book so that we here at the 'talk' can help spread the word. Now, lets put on our running shoes, get out our magnify glass, for it's time to meet the alpha's and heroines of Romantic Suspense!